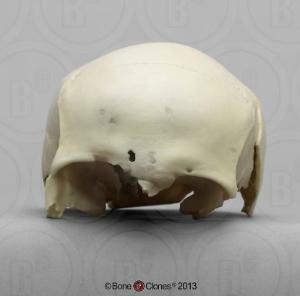 Trauma skull of a 39-year-old European American female, who died due to a shotgun wound to the head. The information about the human female victim was documented at the time of the individual's death. The three images above of the skull show the damage from the wound, including pellets embedded in the bone. The cast of this skull would be an excellent teaching tool for introductory forensic classes.